Make screensavers for all versions of Windows based on sprites, slideshows, Flash movies, videos. Axialis Screensaver Producer is a professional screensaver authoring tool for Windows which lets you easily create hi-quality screensavers for all versions of Windows up to Windows 10 in editions x32 & x64. Sprites - Creating state-of-art screensavers with sprites (animated objects moving on screen) has never been easier. For example, you'll be able to create in minutes a cool screensaver with your company logo bouncing on screen. Flash Movies - If you create Flash movies, you'll produce limitless screensavers. The product is fully compatible with all versions of Flash. Photo Slideshows - You can use many different transitions including the famous "fade-in & fade-out" effects. Several options are available to meet your needs: background sounds, ability to attach a speech to each image, display with automatic screen resolution adjustment, and more. Videos - If you have created a video, you'll be able to create a screensaver from it in minutes. For example, it's a great idea for a company to make a screensaver from a TV ad clip. Many file formats are supported: AVI, MPEG, ASF, QuickTime, MP4, FLV, 3GP. WYSIWYG Editor - To increase your productivity, we have created an advanced WYSIWYG screensaver editor with full Drag & Drop support. WYSIWYG means "What You See Is What You Get". So no surprise at compilation time, your final screensaver is strictly identical. More and more authors actually sell their screensavers. It's very easy using Internet. The product permits you to create demo/limited screensavers. It's very easy because it's just an option of the compilation process. You can limit the trial period or the number of objects displayed. It compiles and produces screensavers compatible with all versions of Windows (from Windows 2000 up to Windows 10, screensavers are compatible with 32-bit and 64-bit versions of Windows). You can customize the screensaver About dialog box. Produced screensavers are compatible with all video configurations (screen size and color depth). To increase your productivity, we have created an advanced WYSIWYG screensaver editor with full Drag & Drop support. WYSIWYG means "What You See Is What You Get". So no surprise at compilation time, your final screen saver is strictly identical. Use a powerful built-in librarian to easily manage all your media and projects files. This is a dockable window (which can be hidden) where you can store, move, copy and extract all the files you're using in your work (images, video, sounds and music). Very easy to use: Double click to open a file in a window (even animations, music, video...), use Drag & Drop to add it in a project. To create screensavers you must work with many media files. A built-in file browser permits browsing your disks and find media files such as images, video clips, Flash movies, audio and musics! This advanced browser display media files in thumbnail mode. By a simple click you open any media file in a viewer window. Creating state-of-art screensavers with Sprites has never been easier. A sprite is a static or animated object which is moving on screen. For example, you'll be able to create in minutes a cool screensaver with your company logo bouncing on screen. Images with transparency (including alpha-channel) are supported. 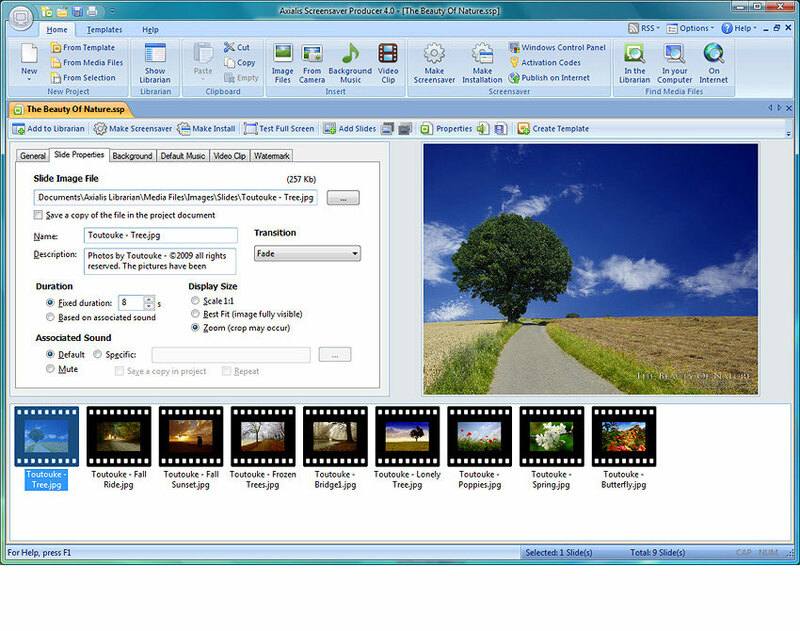 Creating Photo Slideshow screensavers is also possible. Many transitions are available including the famous "fade-in & fade-out" effects which create a smooth and relaxing ambience. Several options are available to meet your needs: background sounds, ability to attach a speech to each image, display with automatic screen resolution adjustment, and more. A cool feature permits adding a static watermark text or logo over the sliding images. The following file formats are supported: BMP, JPEG, PNG (including with alpha channel 32BPP), TIFF, PSD, GIF, PCX, BMP, PCD, WMF, TGA, IFF and LBM. If you use to create Adobe Flash movies, you'll produce limitless screensavers. The product is fully compatible with SWF movies of any versions. You can produce full screen or scaled playback. An interesting feature permits creating interactive screensavers (the user can click in the Flash movie to interact with the screensaver). This could be useful to turn the computer into an information panel, or just fun if you implement a basic game. In order to ensure compatibility of your Flash movie with all computers, the genuine Adobe Flash player plug-in installer can be included in the distribution package of your screensaver. If the end user does not have the latest version of Flash on his computer, it is automatically installed. 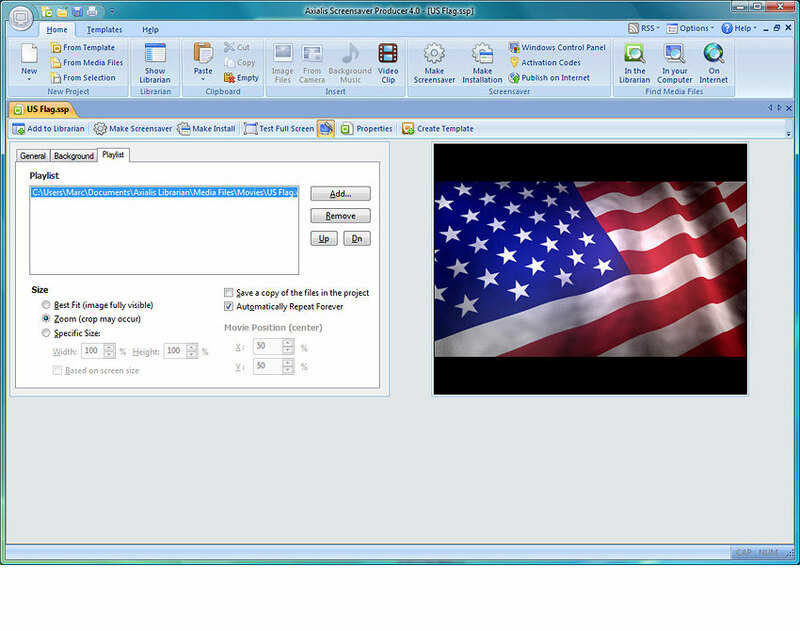 If you have created a Video clip, you'll be able to create a screensaver from it in a few clicks. For example, it's a great idea for a company to make a screensaver from a TV ad clip. The video can be played in loop, fullscreen or at a specified size. Several other options are available. The following file formats are supported: AVI, MPEG, ASF, QuickTime MOV, MP4, M4V, Flash Video FLV, 3GP. The application can create installable packages of your screensavers. This is the best method to distribute your screensavers. The final installation is very professional and lets the end-user easily installing the screensaver. Many options are available to customize the installer (logo, icon, license agreement, command switches...). The procedure takes care of everything so the user don't struggle with Windows options to install the screensaver. It is compatible with all versions of Windows, x23 and x64 editions. If you own a code signing certificate, the installation procedure can be digitally signed. The EXE file which is generated is compatible with code signing. Sell your screensavers by creating Limited/Trial versions. Many authors resell their screensavers through Internet. The product permits creating demo/limited versions of your screensavers. This is easily done by simply adding an option of the compilation process. You can limit the trial period or the number of displayed objects. The screensaver is unlockable by codes. If the user is interested by the trial version, he purchases a code to unlock it. You can generate unlock codes using a built-in feature. You can import PSD images with layers from Photoshop® and easily add graphical objects to your screensavers. General information on Windows screensavers, Interface (2 topics). Getting started lessons (25 topics). How-to step-by-step tutorials (13 topics). Full feature reference (120+ topics). You can download here a few samples of screen savers made and compiled with Axialis Screensaver Producer. 2 versions of each sample are available. An SCR Version (the screensaver file alone - must be placed in your windows/system directory) and an Installable Version (an EXE file that you must launch to fully install the screensaver - user friendly). All install versions come with a friendly uninstall procedure. Shows how you can create a screensaver using a bouncing animated image. The spinning ball animation is a transparent PNG image composed of 6 frames. The background is a stretched image. The Axialis logo is a static sprite. The screensaver and the installer icons have been customized (icons created with IconWorkshop) as well as the illustration images (top of windows). This sample shows how you can create a screensaver using several bouncing sprites with collision effects. The spheres are transparent PNG images (with alpha channel) which permits to create smooth borders. The opacity of the Axialis Logo has been set to 25% to create a watermark effect. No installer or screensaver dialog customization. This sample shows how you can create a screensaver using several sprites appearing on screen at random pace. The heart sprite has been made using a PNG file with alpha channel. It has been duplicated 9 times and each sprite has a startup location outside of the visible area (below the bottom of the screen). The motion has been set as "passing randomly", as a result they appear on screen at different moments. The motion speed has also been set as -70 vertically (from bottom to top) with plus or minus random speed up to 30. It produces a nice effect with sprites moving at different speed. This sample shows how you can create and sell a screensaver. The install version is a 30-day demo. This sample shows an advanced collision scene. All the images are transparent PNG. The smileys have initial speed while the globe is initially static. The collisions make it move. A semi-opaque logo is placed on the bottom-right corner. No customization. No license agreement. This sample shows how you can create a screensaver using animated images using a dark desktop snapshot as background. The car animations are transparent PNG images (with alpha channel) composed of 3 frames to make weels rotate. The alpha channel permits to create smooth edges, shadows and transparencies (you see through the car glasses). The installer has been customized: top image, no setup options, no comment text, no display properties after install. This sample shows how to create a Flash based screensaver to promote a company. In this version, the mouse pointer is not visible and the screensaver stops as usual (mouse move, click or any keystroke). Another sample (Wilbur Yoyo - see below) show you how to create a interactive screensaver with a visible mouse pointer. No installer or screensaver dialog customization. Two install versions are available. The second one has the genuine Adobe flash player plug-in installer embedded. If the end user doesn't have the correct version of the flash player on his computer, it's automatically installed. It results in a larger install file. This sample shows how to create a interective screensaver with a visible mouse pointer. It is a game. The user has to click on the GO button to play yoyo. The screensaver ends by pressing ESC key. This sample shows how a company can create a slideshow to promote your company, your products and a slogan. It uses a slideshow with the fade transition effect. Note that the product slides use a transparent background. No installer or screensaver dialog customization has been added. This sample shows how a you can create a screensaver with images. It uses a slideshow with the crossfade transition effect. The images are courtesy of Russ Schwenkler from Dangeruss Industries. The pictures are not photographs, they have been made with 3DS MAX and Photoshop. No installer or screensaver dialog customization. This sample shows how a you can create a screensaver with your own pictures. It uses a slideshow with the fade transition effect. It uses a slideshow with the fade transition effect. Images are resized to fit fullscreen. Look at the hi-quality of the resulting display. A watermark has been added in the lower-right corner (using the screensaver feature, not hard-written in the images). Photos by TouTouke - ©2009 all rights reserved. The pictures have been downscaled for usage in the screensaver. If you want to get more pictures, full resolution versions or ask permission to use them you can contact TouTouke at this page. This sample screensaver projects shows how to create an endless movie screensaver based on a loop video clip. The movie is displayed fullscreen in zoom mode (no background displayed on all screen formats). Video file courtesy of Movietools.info. This file has a copyright. Please contact the author before redistributing it with your screensavers. Many other free video files are available for download on the website. This sample shows how you can create a screensaver to publish news on the Internet using RSS feeds. The embedded RSS reader tries to access the Internet to retreive news from Axialis Website. If you use a firewall, be sure to grant access to Internet for this screensaver. The logo is a transparent PNG image (with alpha channel) which permits to create smooth borders and a nice halo effects. No installer or screensaver dialog customization. 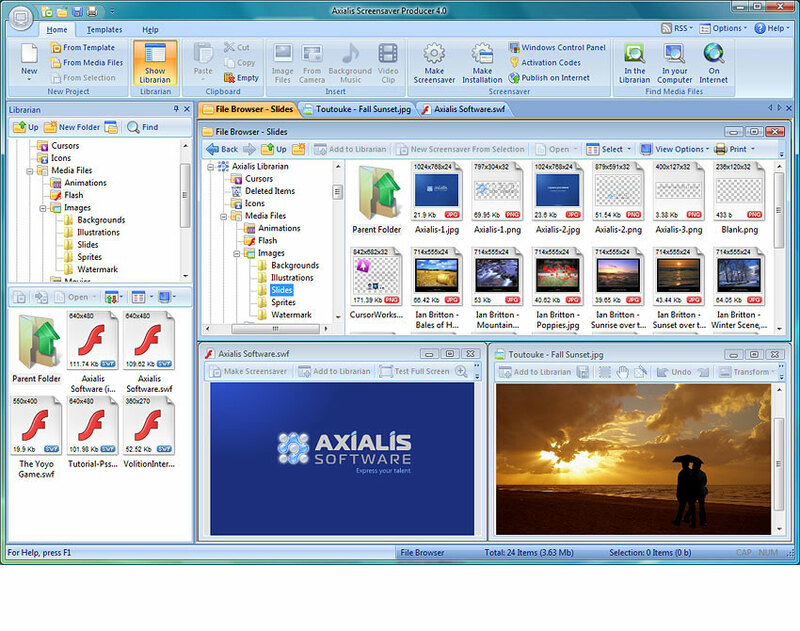 Axialis Screensaver Producer is fully compatible with Windows 2000/XP, Windows Vista, Windows 7, Windows 8/8.1 & Windows 10. The application is compiled in 32 bit mode but works perfectly under x64 versions of Windows. This FAQ covers most common support questions related to Screensaver Producer. If you can't find a response in the list below, you can Contact Axialis Team. What kinds of screensavers can I create with Screensaver Producer? Almost all kind of screensavers can be created with Screensaver Producer. It creates screensavers based on sprites (small animated objects moving on screen), Flash movies, slideshows and video clips (AVI, MPEG, WMV, QuickTime). Is Screensaver Producer compatible with Windows 10? Yes. 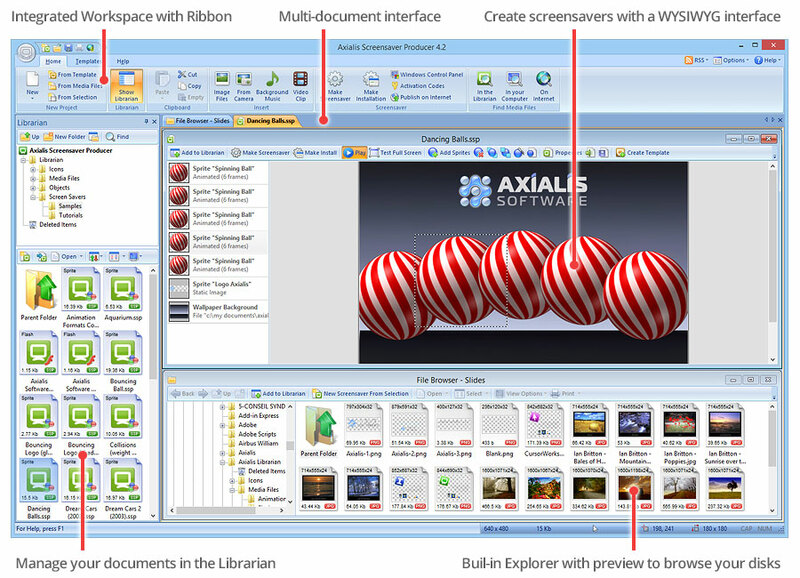 Axialis Screensaver Producer (version 4.2 or superior) is fully compatible with Windows 10 (interface, features, compiled screensavers...). Are my screensavers compatible with all Windows versions? Yes, they're compatible with the following versions of Windows: 2000, XP, Vista, Windows 7, 8, 10. Both 32-bits and 64-bits editions of Windows are supported. Can I distribute or sell the screensavers I've made? Yes, you can produce redistributable screensavers. The product directly compiles your screensavers as installation packages. You can distribute them for any purpose (including profit purpose) without royalties. You can even create shareware/demo versions (with unlock feature). Is it easy for a user to install my screensavers? Yes, you'll be able to create professional and easy-to-use installation packages for your screensavers. Many options are available to customize the installation package (color, illustration image, license agreement, un-installation...). Can I create trial (time limited) screensavers? Yes, the product includes this feature. It permits creating installation packages with time-limited features. The user can test the screensaver for a limited period of time. If he's satisfied with it, he purchases a key to unlock the limitations. You can generate keys using a buit-in feature. Can I create screensavers for Mac? No. The product permits creating screensavers for Windows platforms only. Mac development is not planned yet. Can I use the media files included in the product to create screensavers? Yes, and no. Yes, if the media files have been created by Axialis. No, if the media files have been created by third-party authors. In such a case, you must contact the authors directly to ask for a permission. To get author contact, select the file in the librarian, right-click on it and choose "properties". What about future versions? What's Axialis policy on updates? Axialis Screensaver Producer is living, so periodically we release new versions. 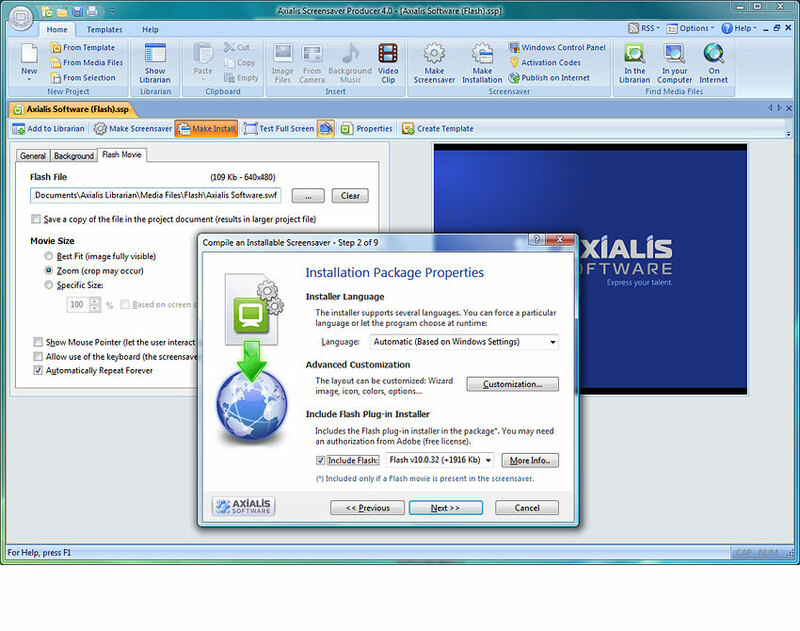 Axialis policy on updates is the clearest possible: FREE UPGRADES FOR LIFE. I bought the Personal edition, can I upgrade to the Professional edition? Sure, you're still a customer. As part of the Lifetime License, you're entitled for a free upgrade to the Professional edition. Your product key remains the same. You can create all kinds of screensavers based on Sprites (animated objects), Flash, Slideshows and Video Movies. 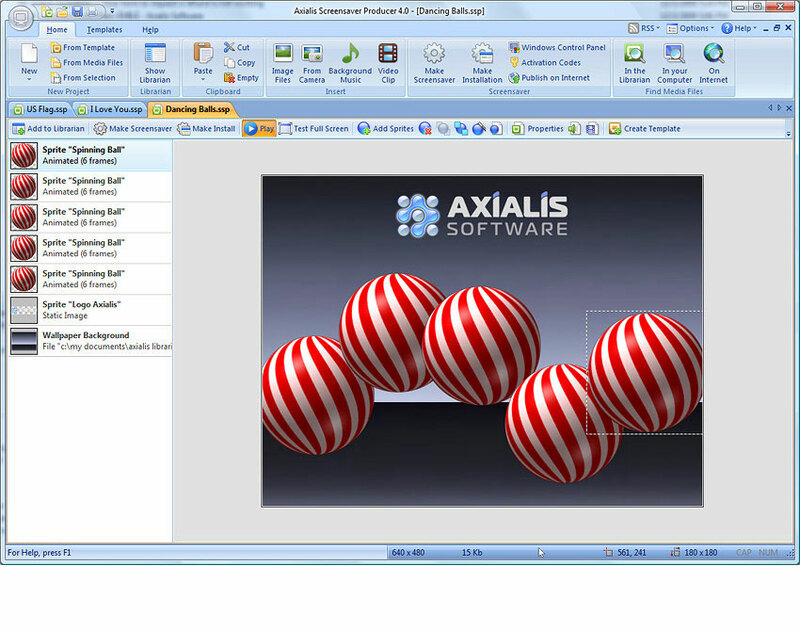 Using Axialis Screensaver Producer you create professional looking screensavers. You work as a pro, you're seen as a pro. No complicated settings. All has been designed to let you be productive and get professional results in minutes. Files are compatible with all Windows versions, from Windows 2000 to Windows 10 (x32 and x64 editions). You can distribute your screensavers on an unlimited of computers royalty-free. This software stands out from the crowd ... All told, we see this as one of the best utilities in its category, and would happily recommend it to anyone who wants to create their own screensavers..
Support for MP4, M4V, FLV, 3GP video file formats: These popular video file formats are supported in all types of screensavers. The playback has been enhanced for smooth HD video playback (Flash Player 9.0.115 or later is required - the Flash Player component can be included in installation packages). Screensavers and installation packages can be digitally signed: SCR screensaver files and EXE installation packages produced by the application can now be digitally signed. 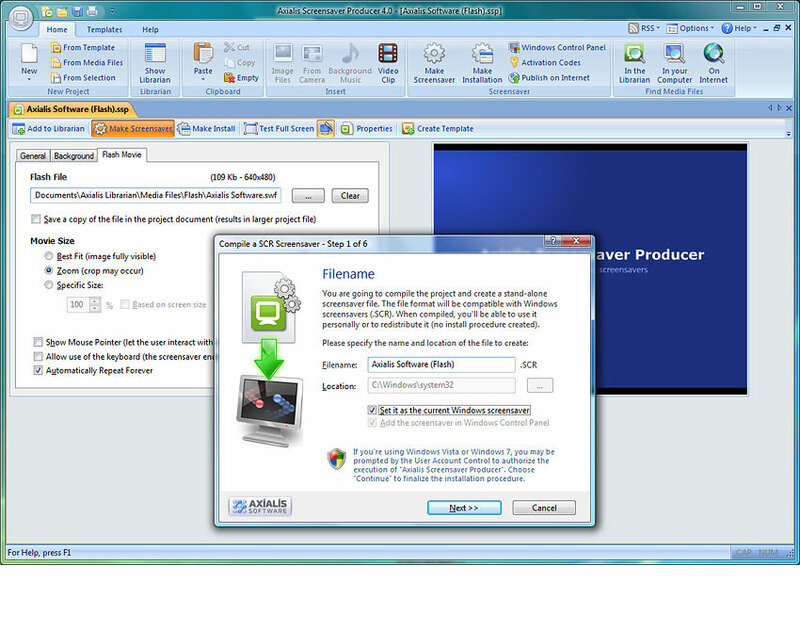 Ability to play MOV video files without Apple QuickTime for Windows: Screensavers can play MOV files (including HD formats) without Apple QuickTime for Windows installed (Flash Player 9.0.115 or later is required - the Flash Player component can be included in installation packages). Enhanced RSS reader compatibility: The built-in RSS reader compatibility has been enhanced to support more sources. Windows Vista and Windows 7 compatibility: The application is now fully compatible with Windows Vista and Windows 7. The particularities and protection features of these operating systems such as the User Account Control are fully supported. Additionally, the compiled screensavers and the associated install procedures are also fully compatible with Windows Vista and Windows 7 in both 32-bits and 64-bits versions (through WOW64). New User Interface: The user interface has been totally redesigned. 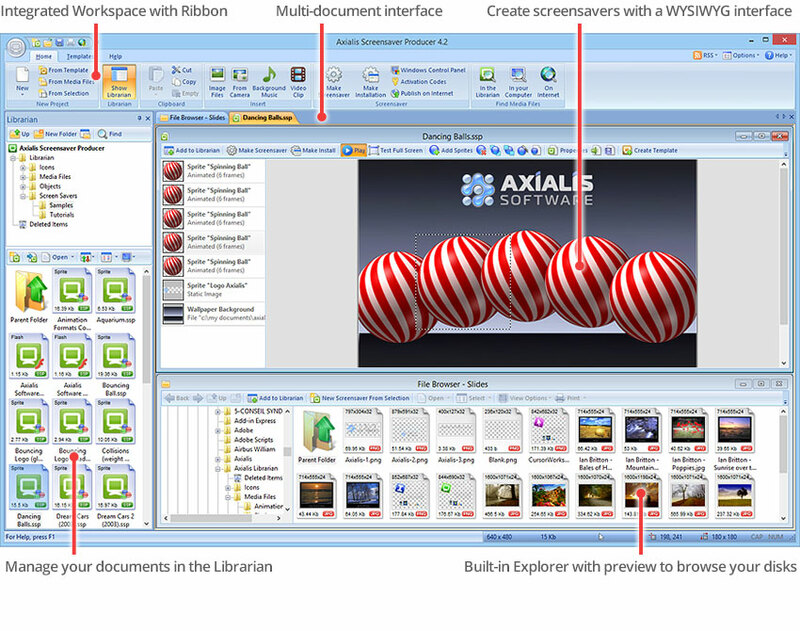 It is now based on a Ribbon-like toolbar as used in Windows 7 applications and Office 2007. The philosophy of use is the same (Librarian, File Browser, Multi-documents...) but the application now complies with the latest user experience specifications. 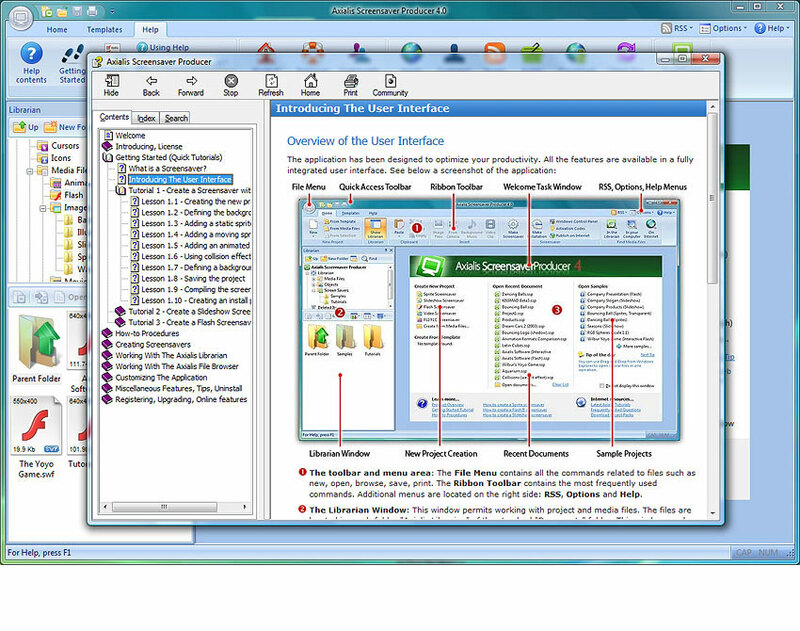 Several interface styles and color schemes are available. New features for Sprite Screensavers: The projects can be designed at different screen sizes. The vertical and horizontal filmstrips are supported. Two play modes are available: Performance or Energy Saving. New features for Flash Screensavers: If you plan to redistribute your screensavers and in order to ensure compatibility with all computers, the adobe Flash plug-in installer can be included in the installation procedure of the screensaver. If the user does not have the required version of Flash, it is automatically installed. A new Zoom display mode avoids any background display. A new mode permits the user to use the keyboard to interact with the Flash movie (a game for example). Only the ESC key ends the screensaver. New features for Slideshow Screensavers: Background sound loop playback has been optimized. A new Zoom display mode avoids any background display. You can add a watermark image over the slides. New features for Video Screensavers: Video loop playback has been optimized. A new Zoom display mode avoids any background display. Ability to customize SCR and Install files with any icon types: You can use any type of icons to customize the SCR and Install files, including the latest Windows Vista and Windows 7 256x256 PNG-Compressed icons.